I enter his office filled with a keen sense of anticipation. I have been invited here, all of me. I know there is a dedicated space prepared for me, ready for whatever I bring. I sit and feel his gentle and vital presence, his soft gaze, and a leaning in, a patient waiting. There is a range of possibility open to me: an exploration of self. Then and there, whatever I say, whoever I am will be accepted and respected. For a second I feel carried away, or rather into the moment and I feel free to sit silently, to ponder, to look inward, to speak. If I burst with exuberance, we grasp hands and dance with joy; if sadness spills forth, he sheds tears with me. If outraged, he shares the injustice. We adventure together into places unknown; we find the life thread of my creativity. I feel valued and clarify my own values. I feel empowered and tap my own potency. He honors me with reverence; I celebrate my uniqueness. In a new essay now available to the New Existentialists’ library, Diane Blau, Lee Bach, Marjorie Scott, and Shawn Rubin share their memories and recall how powerful an impact Clark Moustakas had on the founding of Humanistic Psychology as the Third Force in American Psychology. 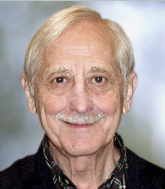 In this essay, the authors also tell us a little about the history of Moustakas’s work, from his early work with children at the Merrill Palmer Insitute in Detroit in 1947, to the founding of the Center for Humanistic Studies Graduate School (now the Michigan School of Professional Psychology), to working well into his 80s. To learn more about this remarkable human being, download the article below — or browse other papers in our library.